A cafe in Westminster Street became a soldier's canteen, known as the Soldier's Rest Room, run by volunteers. The Soldier's Rest Rooms were set up across the country, often by Church groups, with the intention of providing food and drinks to servicemen as well as somewhere to relax. They tended to remain open 24 hours a day. "It did a lot of good for those boys. They were away from home and it was somewhere to go without going in pubs, and a lot of them were very grateful for it." There were sandwiches, one penny on bread, or three halfpence on tea cakes, and rather plain “fancy” cakes. A small allocation of coupons were sometimes allowed to purchase some chocolate bars for the soldiers to buy, but generally speaking there was no increase in food allocation. Volunteers sometimes made little foraging parties, going round knocking on doors asking if they had any food to spare; sometimes a few slices of bread, a piece of cheese, a few biscuits. The local people responded well. The Soldier's Rest Room stayed open all night, volunteers turning up to help although it was not their turn on the rota. Every soldier who came in was fed and given a cup of tea, but never asked for a penny. In the “quiet” room upstairs there were a few tables, and paper and stamped envelopes were provided for soldiers to write home - once again for free. "Each night there was a lady in charge, a man to give support and two or three other ladies to help. At first I just washed up and made sandwiches for hours on end, as girls under 21 were not allowed to go on to the counter amongst all those strangers that none of us knew. Then the age limit was lowered and I could go into the main room and chat to the men. We got to hear all about their families, and admired the photos of their wives and children whether they were pretty or not. As I remember it sandwiches on bread cost one old penny. Those on teacakes were dearer - all of three halfpence. We had cheese, beetroot and salmon. Some of the juice from around the beetroot was mixed with the salmon, making it tastier and redder, so that it looked like grade 1 instead of grade 2 salmon. We also sold buns, biscuits and bars of chocolate - strictly for the troops. If we wanted any supper ourselves we had to take it from home." 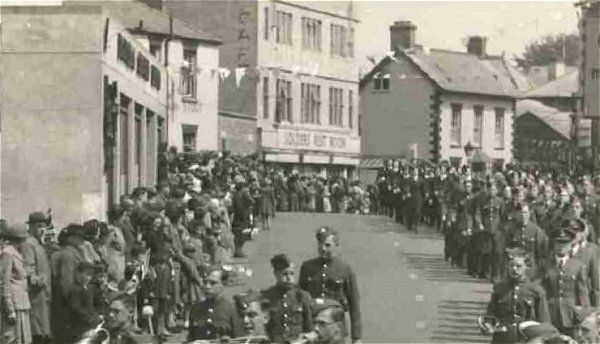 A parade during 'Wings for Victory' week marches down Westminster Street and into Huish. At left is Douglas Seaton's car showrooms on the corner of Clarence Street, with the Heart of Oak (now the Westminster) immediately behind it. At centre of the photograph is the Soldier's Rest Room. 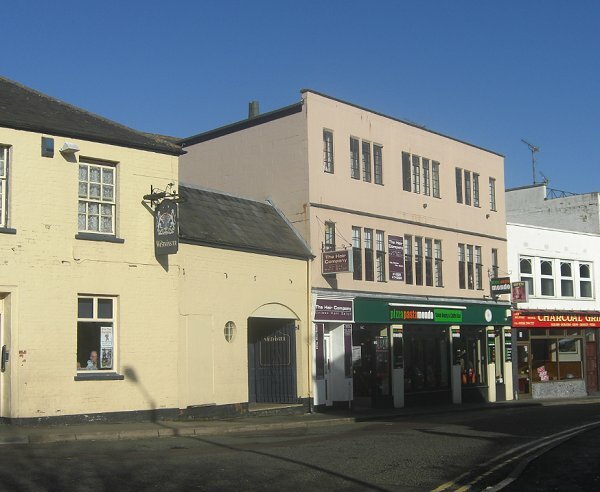 The same building, photographed in 2014.